Make the pastry dough: Pulse together the flour, sugar, and salt in the work bowl of a food processor fitted with a steel blade. Cut the chilled butter into small pieces and add. Pulse until the butter is cut into very tiny pieces, about 30 seconds. The texture will be sandy with very tiny lumps throughout. Shape the dough into a flat disk and wrap tightly in a double layer of plastic wrap. Chill in the refrigerator until firm before using, about 2 hours. If the dough is too firm, let it stand at room temperature for 10 to 15 minutes to become more pliable before rolling out. On a smooth, flat surface, roll out the pastry dough between sheets of lightly floured waxed or parchment paper to a large circle about 12 inches in diameter. Carefully peel the paper off the top of the dough and brush off any excess flour. Dip the cutter into flour and cut out circles of dough. Gently place each dough circle into a tartlet pan (use 24 fluted-edge tartlet pans, such as these), and fit it against the bottom and sides of the pan. Pinch off any excess dough at the top and place the tartlet pans on a baking sheet. Gather together any scraps, knead briefly, roll out, cut, and fit into the tartlet pans. Chill while preparing the filling. Center a rack in the oven and preheat it to 375 degrees. Make the almond filling: Pulse the almonds and sugar in the work bowl of a food processor fitted with a steel blade until finely ground, about 1 minute. Add the softened butter and pulse to blend together well. In a small bowl, whisk together the egg yolk, almond extract, and the remaining ¼ teaspoon vanilla. With the food processor running, pour this mixture through the feed tube and process until smooth and creamy. Place about a teaspoon of filling in each tartlet shell. 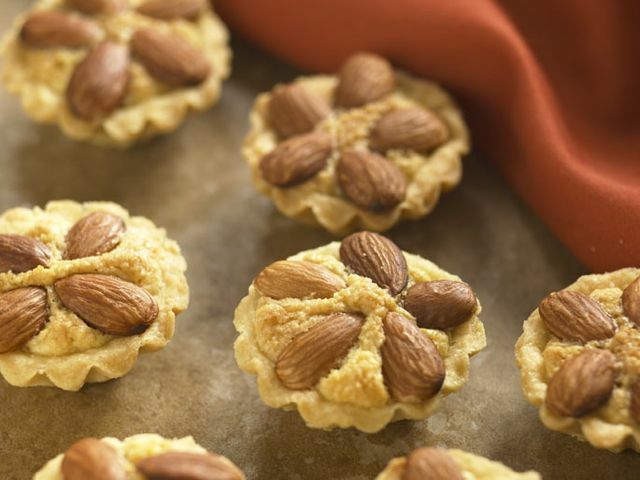 Place 4 or 5 almonds on top of the filling in each tartlet shell. Press the almonds down lightly. Bake the tartlets for 16 to 18 minutes, until the filling is puffed and light golden brown. Remove the baking sheet from oven and transfer to a rack to cool completely. To remove the tartlet shells from their pans, gently tap each pan on the counter top. Store the tartlets in a single layer on a baking sheet. Cover the top of the tartlets with a large piece of waxed paper, then tightly wrap the pan with aluminum foil. They will keep at room temperature up to 4 days. You can replace the almonds with walnuts, pine nuts, or pecans. The pastry dough can be made in advance and kept in the refrigerator, tightly wrapped in a double layer of plastic wrap, up to 4 days before using. To freeze up to 4 months, wrap it in a double layer of plastic wrap and place it inside a freezer bag. Use a large piece of masking tape and an indelible marker to label and date the contents. If frozen, defrost in the refrigerator overnight before using. If the dough is too cold to roll out, let it stand at room temperature to become pliable. The filling can be made and kept in a tightly covered container in the refrigerator up to 3 days before using.